Would You Get Engaged Without Receiving A Ring? Personally I feel that it should be a major requirement to get some type of ring if you want to engaged especially if it’s me. It doesn’t have to be $5,000 like my dream Tiffany’s ring, but hell you can at least go to Wal-Mart like the guy on I’m 16….and Pregnant and get that $24.99 pink heart shaped ring. 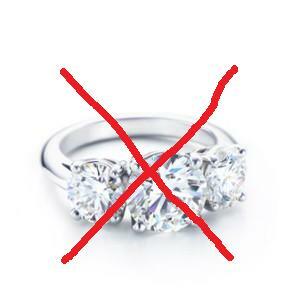 Personally, when I get engaged I need a ring because it will show that the man has some sort of financial stability. I’m all down for the female making more money, but an engagement ring will show me that you’ll be able to contribute to this family in some type of way. If you can’t contribute to our household why do I need you? Honestly, I can do bad all by myself. Hell, how is it going to look with me at Thanksgiving Dinner with my family announcing my engagement and all I have to show them is the mole located on my ring finger? The girl I was discussing earlier was only 17 when she got engaged and her boyfriend was 18, and they both were heading off to college. Obviously it’s not smart to get engaged right out of high school unless your boyfriend/girlfriend is going in the military and you can’t do without them (I don’t think that’s smart either personally. ), but at least the guy/girl heading off to boot camp can afford a ring and you know you won’t have to worry about living in a TV box on the 5th and Broad downtown. I will make an exception to this though. If you are going to medical school feel free to pop the question without a ring because I know once your residency is over a pretty ring will come sooner or later. You have to truly love a person to get engaged without a ring I feel. Perhaps I’m just old-fashioned, but I feel like a lot of people will agree with me. This entry was posted on January 15, 2010 at 2:44 pm and is filed under Uncategorized with tags engaged, engagement rings, Life, Love, marriage, relationships, rings, teenage engagements. You can follow any responses to this entry through the RSS 2.0 feed. You can leave a response, or trackback from your own site. Get the ring! You never want to be taken for granted. Making this concession, leads to wonder what else are you willing to do without? Hmm.